The best thing to happen to Dimmu Borgir in years was the much-publicized split with long-time clean vocalist/bass guitarist ICS Vortex and keyboardist Mustis. Not that the transition was smooth in the least. To get to “Eonian” the world had to endure the colossal failure that was 2010’s “Abrahadabra”. If Dimmu Borgir’s very public crisis of identity has yielded anything substantial it’s that they have at long last shed the veneer that they are the vanguards of extreme metal, black – or otherwise. No. “Eonian”, like its rightly maligned predecessor, is power metal in everything but name. Trudging, dirgey, marching power metal with an undercurrent of triumphant, glorious melodies and a thick layer of would-be evil theatrics. As unbelieveable as it might sound, “Eonian” is the best Dimmu Borgir album in many, many years, or at least since 1999. It might sound nothing like the Dimmu Borgir of yore, or even like anything they have done prior for that matter. In point of fact “Eonian” is shockingly good at whatever Dimmu Borgir is attempting here. It is by far the least actively hostile outing this band has unleashed upon the world. …And 12 different versions of “Eonian”? That’s pushing it, even for Nuclear Blast Records. Plenty of blood has been spilled on these pages detailing how terrible Norway’s most famous export is most of the time. A good deal of that venom warranted because Dimmu Borgir is godawful more often than they’re not. 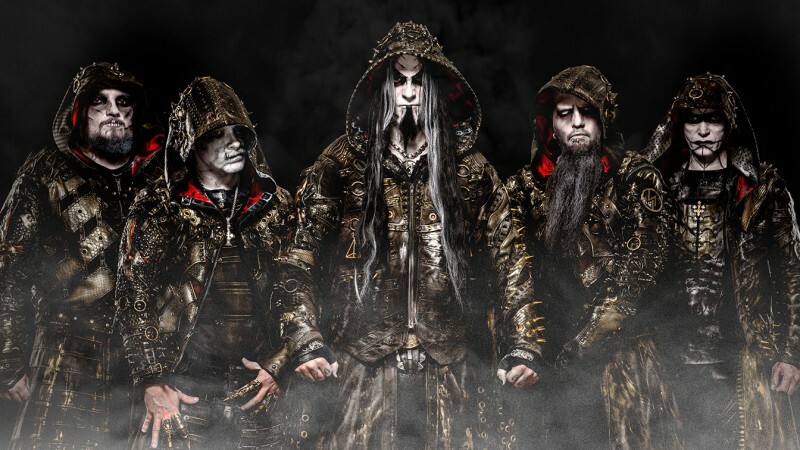 Over the course of 25 years Dimmu Borgir went from your average no-budget black metal band to Victorian age romantics, wanna-be Cenobites, and post-apocalyptic warriors to tundra gypsy-barbarians/pirates and now… futuristic hooded warrior-monks? "Eonian" is about a lot of things: letting go of preconceptions, overcoming barriers to reach one's maximum potential and cleansing oneself from spiritual detritus in order to attain complete and perfect awakening. In other words, roughly the same Buddhist subjects that Caelestis handles so wonderfully. So, Dimmu Borgir is really trying this time around. Trying so hard to distance themselves from their old sound that they might as well be an entirely different band, but trying indeed. At their most potent and pointed Dimmu Borgir was stunningly mediocre. At their worst they were actively hostile to the listener. Most of the time they were just bloody annoying. Moreso than on “Abrahadabra” does “Eonian” revolve around contrasting atmospheres and instrumentation. Whoever still believes that Dimmu Borgir plays, or ever played, black metal is massively deluded. The Dimmu Borgir of today is nigh on impossible to tell apart from the likes of Nightwish, Therion and Luca Turilli's Rhapsody. Except for the would-be evil corpse paint and costumes, that is. For the lack of a better descriptor “Eonian” sounds almost New Age-y in its choice of melodies and overarching atmosphere. Granted it fits with the overly prententious abstract esoteric and faux-philosophical concept they are pushing, but Dimmu Borgir was never known for its lyrical prowess. “Eonian” is custodian to lyrical gems as, for example, ‘Interdimensional Summit’ dispenses with the obvious by stating that “to the trained eye / there are no coincidences” and ‘Ætheric’ insists that “to govern thyself / you must know your past” or the memorable choral chorus in ‘Council Of Wolves and Snakes’ that mantra-like posits that “we are gods in the making / we are gods for the taking”. It’s all so wonderfully rich coming from a band as blissfully unaware of itself as Dimmu Borgir. No. Whatever this is supposed to be it doesn’t hurt as much, or at all, as some of this band’s prior records. 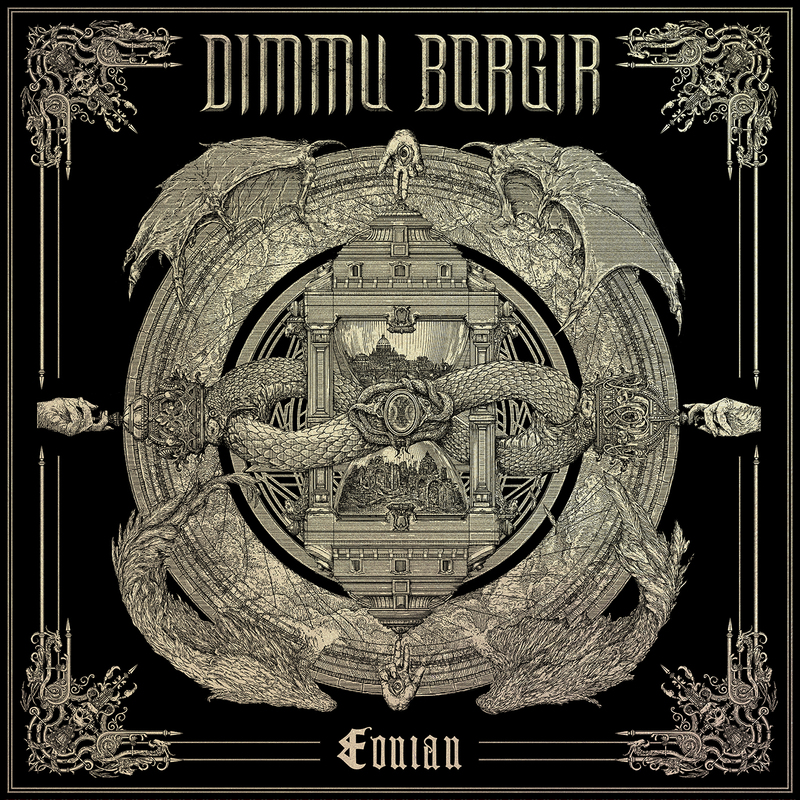 “Eonian” is a Dimmu Borgir record where the keyboards are inobtrusive, where the orchestrations and choirs are responsible for the brunt of the dynamics and where Daray, one of Poland’s best underground metal drummers is reduced to a very expensive metronome. Poland’s best drummer is reduced to a metronome. It is so unadventurous Tjodalv could have drummed on it. In the production notes can be gleaned that Fleshgod Apocalypse keyboardist Francesco Ferrini and long-time collaborator Gaute Storås arranged the orchestrations, with the latter also handling the Schola Cantrum Choir and Jens Bogren engineering the thing. 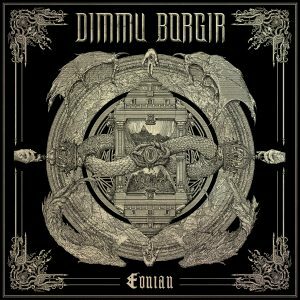 “Eonian” is probably the best sounding Dimmu Borgir record thus far. Unless you care about little things such as guitars and drums. Since this was mixed by Shagrath the vocals, choirs, orchestrations and keyboards take prominence. Naturally with the guitars being as buried as they are, it’s surprising that they sound as crispy and clear that they do. Galder actually tries on this album too. Does he ever try. There are actual guitar solos again this time around and Dimmu Borgir still chugs as if they have a bone to pick with populist groove metal bands like Machine Head and their ilk. Speaking of Shagrath. He was, is, and continues to be this band’s weakest link. At least now his other talents are put to good use as he contributes on keyboards and shares bass guitar duties with Galder and Silly-Nose. Shagrath always better at everything excluding vocals. The Zbigniew M. Bielak artwork is probably the most restrained this band has had in a long time and includes an hourglass, a clock, the lemniscate and assorted Satanic imagery – eventhough “Eonian” at no point resembles a traditional black metal album. Dimmu Borgir’s reinvention as a power metal band would be complete if they finally decided to drop their overcooked black metal imagery and ornate stage costumes, but that is probably a tad too ambitious for this bunch. “Eonian” is pretty tolerable when you’re prepared to meet it halfway. “Eonian” continues on the path the band embarked on with “Abrahadabra”. Whether their fans will follow is another matter. Never before has Dimmu Borgir sounded so focused and on-point as they do on “Eonian”. It’s nothing short of a miracle that Norway’s most popular export was able to conjure up an undertaking so bombastic, so melodramatic, so completely different from anything and everything they have done prior. It’s interesting to see where Dimmu Borgir goes from here and to what degree they will further embrace their newfound appreciation for power metal. It’s hard to come to grips with how good “Eonian” is when it fires on all cylinders, and even Shagrath’s tired croaks aren’t as annoying as they usually are. This time around the choirs handle the more ambitious parts – and the record is so much better for it. It’s hard to believe that this is the same band that wrote ‘In Death’s Embrace’, ‘Moonchild Domain’ and ‘The Insight & the Catharsis’. Two of these men were responsible for “Stormblast” and “Death Cult Armageddon”, one a record legendary for its atmosphere and thievery, the other for its relentless drudgery. Dimmu Borgir is nigh on unrecognizable on “Eonian”, which isn’t necessarily a bad thing. The masks have come off from The Kings Of the Carnival Creation, but it’s not like they are suddenly venturing into uncharted territory. “Eonian” is the product of writings that were on the wall many years ago to anybody remotely perceptive – and it actually is suprisingly good.